Preventative Maintenance Diligent sail care and maintenance will insure that your sails last as long as possible. We recommend that your sails be inspected and serviced once a year. The sooner any chafe, mildew, or other problems are detected, the easier it is to take care of them. Each winter we offer a full valet service for both sails and covers. Following washing, which is all carried out in-house, the sails/covers are dried and inspected. Required repair work is carried out at this stage, if significant problems are highlighted at this stage then a report will be made. UV protection Ultraviolet rays are the number one enemy of your sails. Left exposed to the sun when not being used, your sails will deteriorate rapidly. Your main and mizzen sails should be protected whilst not in use with a sailcover. Furling Genoa should be fitted with a UV strip if left furled on the system, please do check though that you have furled the sail the correct way, we must have at least 24 sails in each winter that have been rolled incorrectly thus exposing the sail to UV! Flogging & Overloading Sail care starts with learning how to properly set and trim your sails. A sail left to flog will result in the fabric being broken down quickly and become prone to tearing. 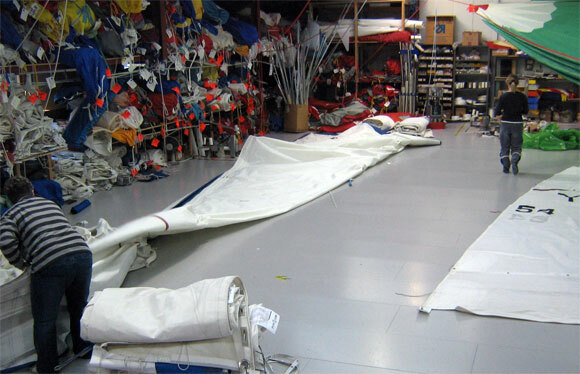 Correct sheeting will load the sail in the correct way and properly adjusted leech line will protect the fabric. Washing your sails Depending on the number of hours and type of use, it will become necessary to wash your sails. Washing serves two purposes: First, it rids sails of salt, dirt, and other contaminants. Salt-encrusted sails are harder to handle, and because salt is a crystal it will shorten the life of your sails. Second, washing helps to reduce the risks of mildew growth. Whenever possible store your sails dry. All sailcloth is susceptible to mildew when stored wet.